1. Plan out where you want the misting line. Generally the mist line is installed around the perimeter of the patio or overhang. It is important that all the perimeter is covered so as to make the system work better in breezy conditions, no matter which way the breeze blows you are getting the benefit of the mist cooling. Measure the perimeter. 2. Mist line is available in 8ft or 20ft lengths. Only 8 ft can be shipped by UPS, 20 ft can be shipped by truck. Decide where your mist line is going to start, and if you are going to use this point to attach the mist tube that is coming from the pump. Standard fittings include straight couplings and 90 degree elbows for sharp corners. You can also bend the mist line with a standard tubing bender for other shapes and curves. You will need a coupling at the end of each length of mist line to attach the next length and a plug for the end. 3. Cushion Clamps are used to attach the mist line and mist tube to the building. You will need a clamp every 24" for attachment of the mist line and tubing from the pump. 4. Decide where you want to place the pump. The pump is not silent! Place it away from the immediate patio area so as not to have to listen to it. The pump is about as noisy as a room A/C unit. The pump needs a water and 110v electrical hook up and can be placed up to 400 ft away from the mist line without significant pressure loss. If you use one of our indoor or interior mount units it is important to install it in a covered area out of the weather. Our totally enclosed unit can be mounted in any exterior area that is convenient. Choose a spot that is relatively easy to access so as to make it easy to change the filter. Suggestion: mount pump in the garage, and route the high pressure tubing in the attic to the patio in the rear of the house or mount the pump under the house in the crawl space or basement (raised floor construction) and route the mist tube to the patio. Take care to use cushion clamps for the mist tube so it will not rub on any surface, due to the slight vibration of the mist line it needs to be installed securely with cushion clamps or pulled inside a plastic conduit. 5. Let's Make a List! Figure the total amount of mist line (to the nearest length) you will need by your perimeter measurements. Figure the cushion clamps at 1/2 the footage of your perimeter measurements plus the mist tube, which will give you enough clamps for mounting every 24" of the mist line and mist tube. Figure the total number of couplings that are needed at the ends of the mist line and elbows for the corners. You will also need a coupling that is a plug at the end of the line away from the end that is being fed by the pump. Figure the total footage of the mist tube from the pump and the misting line. And now you have a list of materials for a first class mist cooling system. 1. Mist cooling fans are easy to install. The pressure pump is the heart of the system. The pressure pump, which operates at 1000 PSI, needs to be sized to the total number of mist nozzles in the system. Mist tubing between pump and fans can be for several hundred feet, all from one pump. Mist rings installed on fans can create as much as 6 cooling tons per fan. 2. 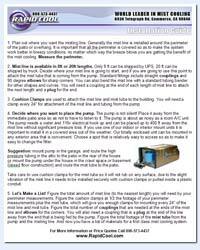 Pressure pumps can be placed at locations convenient to the utilities available (water and electricity). 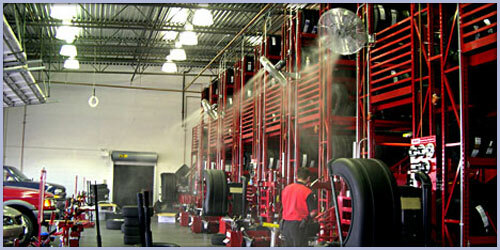 High pressure mist line (flexible tubing) routed to fans can be looped from one fan to another for a complete system. Mist cooling fans placed in production areas or loading docks keep areas cool enough to cause production to stay a level that make good economic sense. Keep your employees cool and keep them happy. 3. Fan mist cooling will lower the temperature up to 25 degrees. This is the most economical way to cool large warehouses or shop areas. 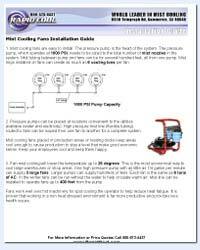 One high pressure pump with as little as 1/4 gallon per minute can supply 3 large fans. Larger pumps can supply hundreds of fans. Each fan is the same as 6 tons of AC. In the winter fans can be run without the water to help circulate warm air. 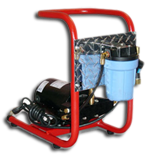 Mist line can be installed to operate fans up to 400 feet from the pump. Fans work well over hot machinery for spot cooling the operator to help reduce heat fatigue. It is proven that working in a non heat stressed environment is far more productive and provides less health issues.